Care for skin 24/7 with these three high-performance, every day essentials that work together to create the ultimate age-defying, cleansing, balancing and nourishing skin care. 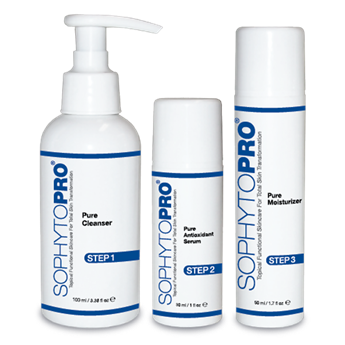 The SophytoPRO® cleansing technology is packed with moisturizing benefits that effectively, gently remove surface grime and makeup and waterproof mascara. Harsh cleansers strip the topmost lipid barrier and may aggravate blemishes by eliminating the protection the skin needs. Topical application of fatty acids alleviates breakouts by re-stabilizing the lipid barrier and restoring optimal skin function. With 80% of skin aging caused by free radical exposure, it is important to provide daily doses of effective, topical antioxidants. Other products claim they provide ingredients like green tea, but if the product does not have a rich amber color like SophytoPRO® Pure Antioxidant Serum, it simply won’t contain enough antioxidants to be beneficial. On the most basic level, moisturizers hold water in the outermost layer of skin and also act as a temporary barrier. Moisturizers that contain quality natural oils high in essential fatty acids, lipids, glycolipids and phospholipids also serve as a readily available source of fat soluble vitamins to nourish the skin.